#Informatics : Why can't I just pre-check this order? Hi all - Sorry it's been a few months since my last post. No excuse other than lazy blogging. Oh, and developing an Informatics platform in the middle of Meaningful Use, ICD-10, and new regulatory focus on interoperability and configuration - It's can keep you very busy! "Why can't I just pre-check this order?" "Why can't I just make this order set?" "Why can't I just approve this policy?" "Why can't I just do what I used to do BEFORE?" There is an answer to these vexing questions. It's called workflow. And if you're not clear about workflow is, you won't know how it quietly impacts us all. From Wikipedia's entry on Workflow : "an orchestrated and repeatable pattern of business activity enabled by the systematic organization of resources into processes that transform materials, provide services, or process information"
From Whatis.com : "Workflow is the series of activities that are necessary to complete a task. From the very talented #workflow expert, Charles Webster, MD : "Workflow is a series of tasks, consuming resources, achieving goals." Or from Google : "the sequence of industrial, administrative, or other processes through which a piece of work passes from initiation to completion." From my perspective, workflow is what you do, how you do it, and when you do it. It's the [ WHO ] will [ WHAT ], in order, that drives the basic processes of your organization. Workflow is your recipe for success. If you're a chef, workflow is your winning recipe, perfectly executed. If you're a hospital, it's your clinical policies, perfectly executed. Workflow does not answer every detail about diagnosing pneumonia, but it outlines the mission-critical steps you need to identify/register your patient, listen to your patient, diagnose their disease, treat their disease, document their treatment, and finally bill effectively. However you define it, organizations with good workflows generally succeed by delivering a high-quality product, predictably, at a good price. Organizations with bad or confusing workflows will struggle to do that. So it's vitally important to have good workflows to support your goals. When discussing/documenting workflows, it's very common for people to use Visio or other software to create swim-lane diagrams or other algorithms or flowcharts. In experienced hands, they can be vital in documenting current and future-state workflows, but they can require some degree of training and time to create and interpret them correctly. [ WHO ] will [ WHAT ] are the mandatory pieces of every workflow line. [ how ] [ when ] [ where ] [ why ] are the optional descriptors of every workflow line. 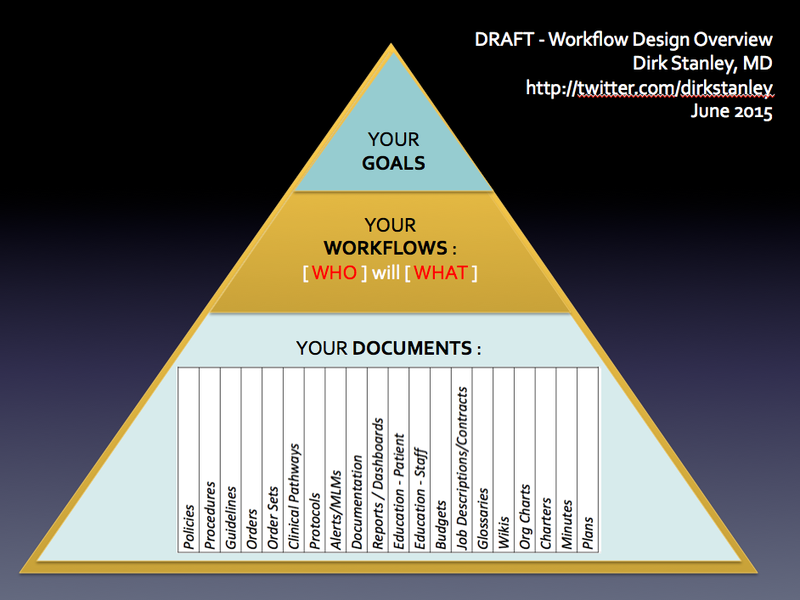 Now this incomplete workflow leaves us with a lot of questions, about who exactly should be doing these steps? By looking at the workflow designed with this template, you can quickly rearrange steps, reassign roles, and develop lean, cost-effective workflows that ultimately support your organizational goals. I believe that teaching this template to your staff can help them to easily write, analyze, and better develop your common workflows and procedures. SO WHY CAN'T I JUST ADD THE BOX LIKE I USED TO DO BEFORE OUR EMR? The reason is because your workflows support your organizational goals. And what supports the workflows? The people and tools in your organization. By that I mean all of your talent, and all of the tools they use to do their jobs : Your policies, procedures, guidelines, orders, order sets, clinical pathways, protocols, Alerts/MLMs (Medical Logic Modules), Documentation, Reports/Dashboards, Patient Education, Staff Education, Budgets, Job Descriptions/Contracts, Glossaries, Wikis, and Org Charts. What workflow(s) is/are needed to achieve the goal? What tools will we need to effectively support the needed workflow(s)? 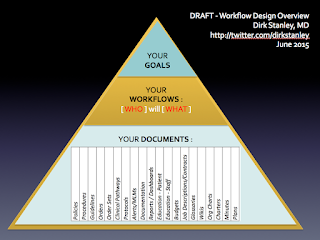 … where the documents support the workflows that support the goals. And so depending on the workflow change, or desired new workflow, you have to mentally go through each one of those tools and ask : Do we need to create/modify/delete this tool to effectively support the desired workflow? Some smaller change projects might be accomplished through developing only one of those tools. Other larger change projects might require the development of many tools. What is the organizational goal? What desired workflow does this order set support? What other tools are working together to support this desired workflow? And if pre-checking the box will mean changes to other tools, then I might tell them something that sounds like this : "I know that pre-checking the order seems like a simple issue, but to make sure it continues to harmoniously support the workflow and organizational goals, we may have to update the staff education, patient education, and pharmacy budget too. Let's look at these and how they work together before we make the change." Workflows also teach us that we are all, in fact, interconnected - both clinical and administrative staff. Each side depends on the other for success. WE DIDN'T DO THIS BEFORE - WHY IS THIS DIFFERENT NOW? They make large amounts of data easily available for analysis - Reports that used to take months of chart review now takes seconds. It's easier to find poorly-supported workflows. They enforce stricter documentation standards that were harder to enforce on paper - The legal-grade authentication of most EMRs prevents scenarios where one-person-filled-out-the-form-and-another-signed-it, just to satisfy a confusing workflow. So I generally tell people that after their enterprise EMR goes live, they may experience a demand for workflow analysis and redesign to a degree and standard they were unused to in the paper world. I suspect it's this demand for high-grade, well-supported workflows that is driving the demand for trained, qualified, and experienced clinical Informaticists - And I'm proud to be one of them! As always, this blog is for educational purposes only. I welcome discussion and feedback! How do you explain to end-users why it's sometimes-not-that-simple? All comments below are welcome!